February’s #OneCookbook Club, let’s talk about it! There are now over 175 people cooking together virtually in this club, how awesome is that? (Join HERE!) 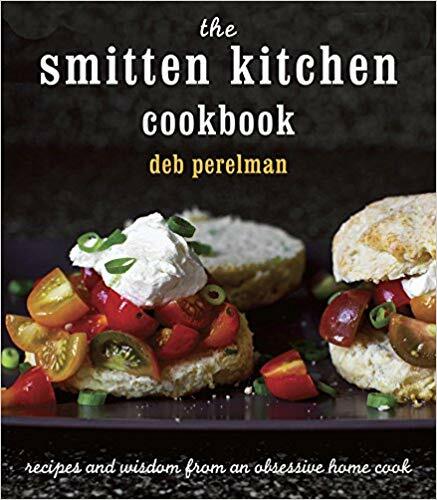 This month we cooked from The Smitten Kitchen Cookbook, by Deb Perelman, who is one of my longtime food writer crushes. Her blog, Smitten Kitchen, was the first I started following around 10 years ago. 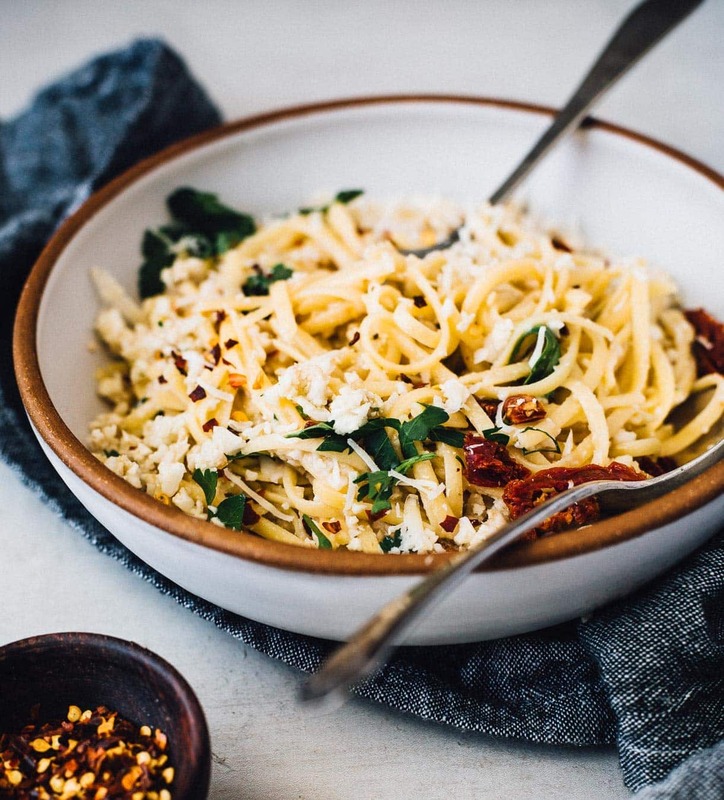 I’ve always been drawn to her well written recipes (I’m a firm believer that an excellent, well-written recipe can allow someone who has never cooked before to make anything they want) and her practical advice that more than once, has changed the way I cook. I love how she often weaves a new technique into a familiar recipe or maybe one interesting ingredient tossed in, but nothing too crazy. To get a good overall feel for the cookbook, I pick four recipes from different meal genres. This month that included a savory breakfast, two main dishes, and dessert. Here’s a little review of each recipe, and photos! If you love shakshuka, a Mediterranean tomato baked egg dish, you’ll love this Mexican twist. The tomato sauce comes together from scratch in a blender, with onion and jalapeño. Cooked on the stovetop to thicken, the black beans and eggs are added. The top is then covered with cheese, and baked until bubbling and golden brown. 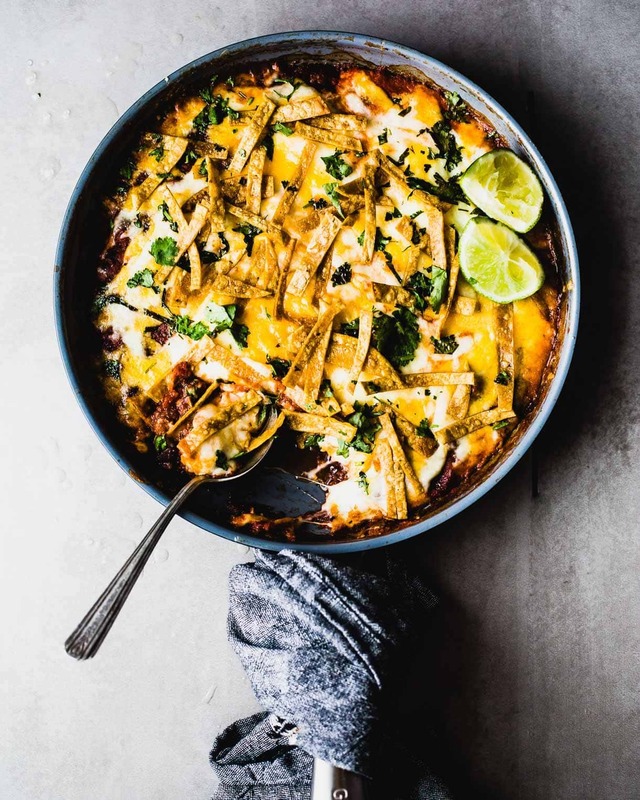 You’ll also add crunchy tortilla strips, which adds just the right contrast to every bite. It’s hearty and well spiced, a great brunch recipe or even dinner. I chose this recipe (reprinted here) because I had major doubts about it. When I read that the pesto was made from raw cauliflower, I just couldn’t imagine that it would taste good. So I put it to the test, and was definitely wrong. 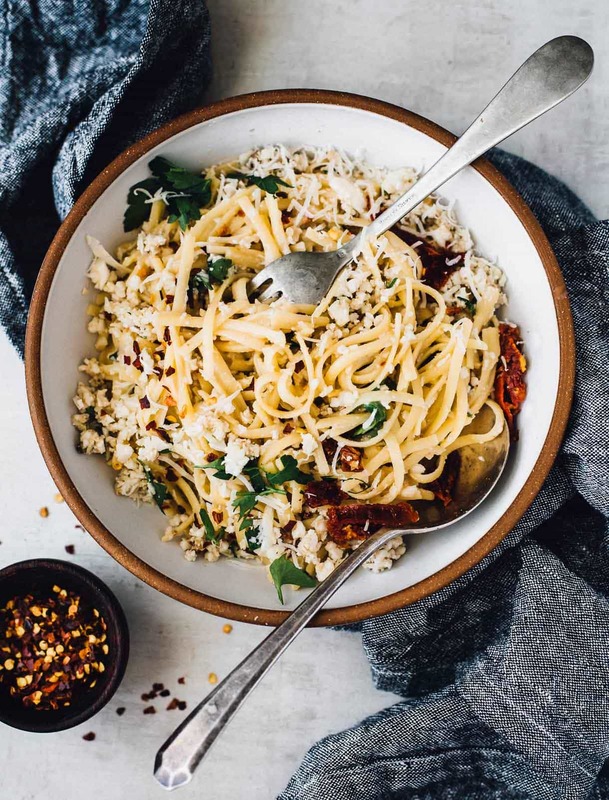 To make the pesto, riced cauliflower is mixed with garlic, sun dried tomatoes, toasted nuts, capers, and parsley. AND IT’S DELICIOUS. (tip: Use walnuts instead of pine nuts as the recipe calls for to save some money at the grocery store.) The pesto is incredibly flavorful and almost like a chunky sauce in texture. Sun-dried tomatoes take the whole thing to the next level – imagine sweet, juicy pockets in the midst of everything savory and carb-y. Any leftover cauliflower pesto is really good on toast, in salads or bowls. 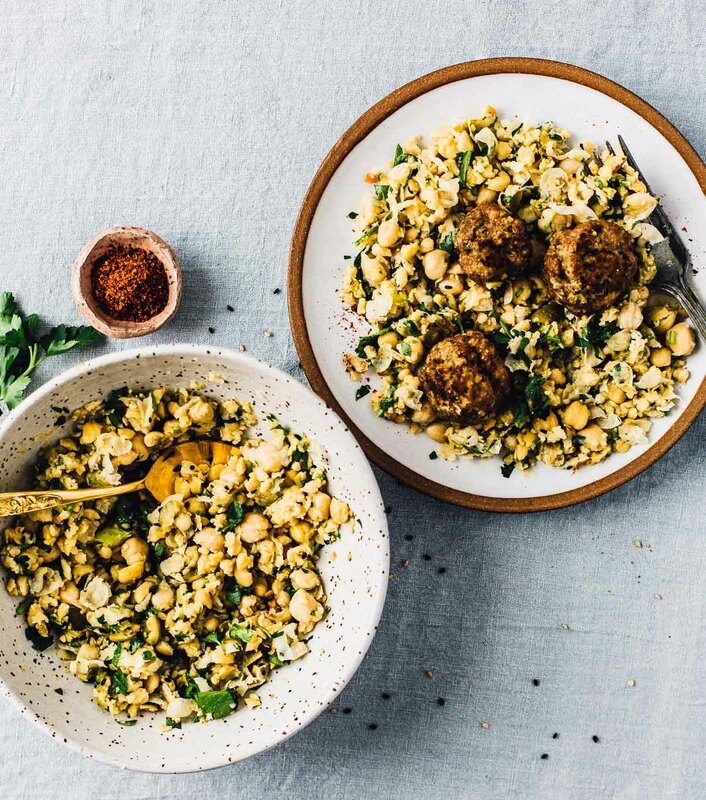 When I saw the smashed chickpea salad, I knew I had to make this recipe. Paired with not-your-average turkey meatballs, this was a dinner I will be making again and again. With middle eastern flavors throughout, each bite is better than the last. Sesame seeds, cumin, parsley, olives, garlic – so many yummy ingredients! The meatballs were moist and so easy to make. (tip: I recommend using at minimum, 90% lean ground turkey so that the meatballs don’t dry out.) And leftovers were fantastic. Definitely a recipe that could be meal prepped and eaten throughout the week. And finally, a versatile cornmeal cake that can be made all year round. 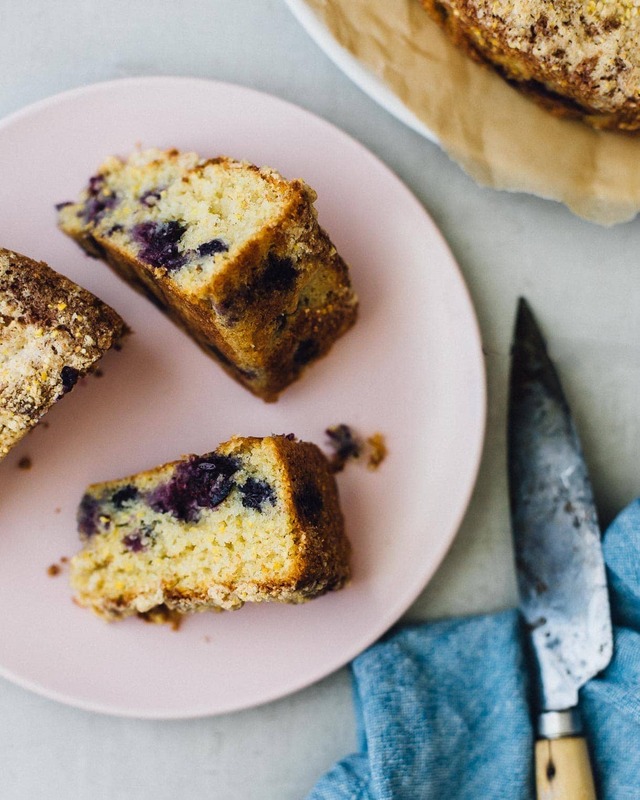 It’s reminiscent of a bakery style blueberry muffin – sweet and buttery, with a streusel top. 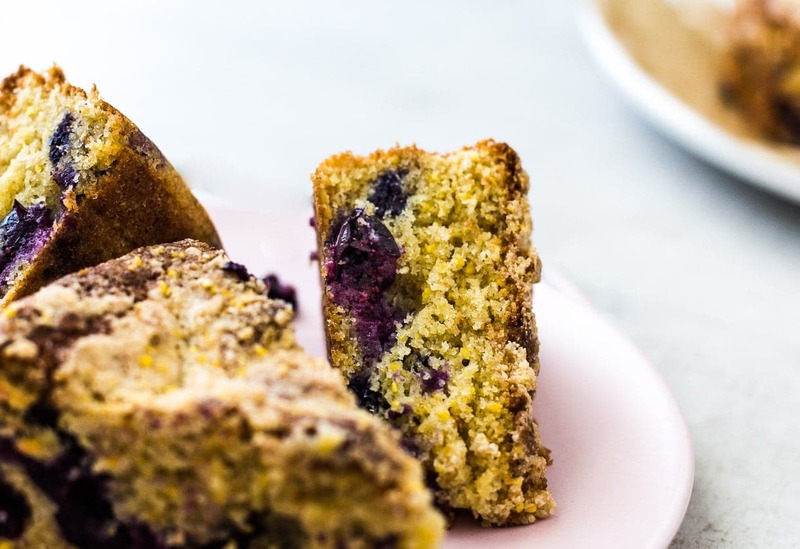 The blueberries add a juicy burst of flavor throughout, and I love the slightly crunchy texture of the cornmeal. I made this cake gluten-free by substituting the all-purpose flour with a blend of sorghum flour, sweet rice flour, and oat flour. You couldn’t even tell the cake was gluten-free. Total win. 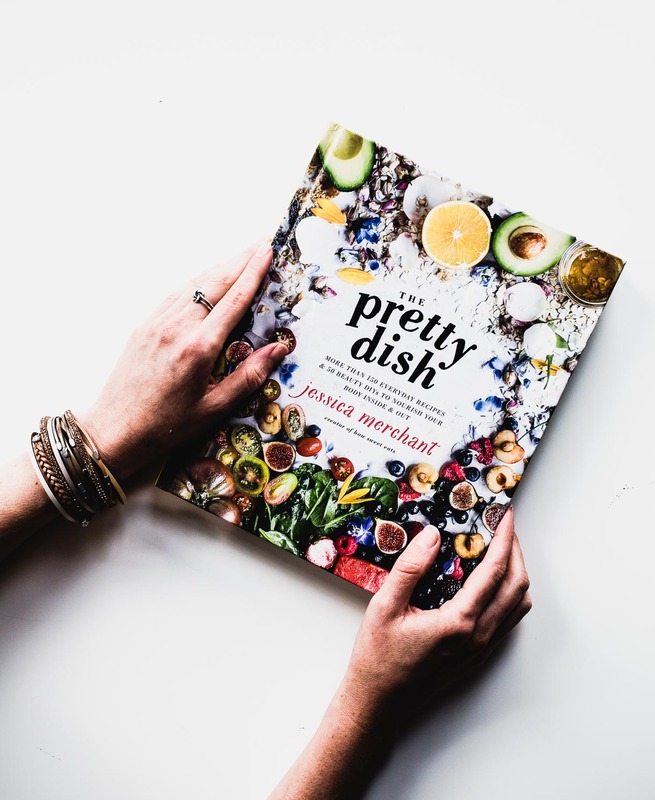 For March the group picked The Pretty Dish to cook from, by Jessica Merchant, who writes the blog, How Sweet Eats. I made this 3 Ingredient Bacon Parmesan Asparagus recipe from it last year, and am excited to explore the cookbook more. You can JOIN the #OneCookbook a Month club here at any time, and it’s free! Just a bunch of people around the world cooking together. :) Hope to see you. I love the cookbook club! So much fun! So great to have you, Cassie! Love seeing how everyone cooks!